Our brains are capable of creating lots of new neurons and neuro pathways everyday. If a thought or action is repeated over time we can get into patterns. When neurons “fire together, they wire together”. Habits are formed and we can get stuck in our ways of thinking. Art making can actually help with getting us out of these thought patterns, bringing us into the present moment. 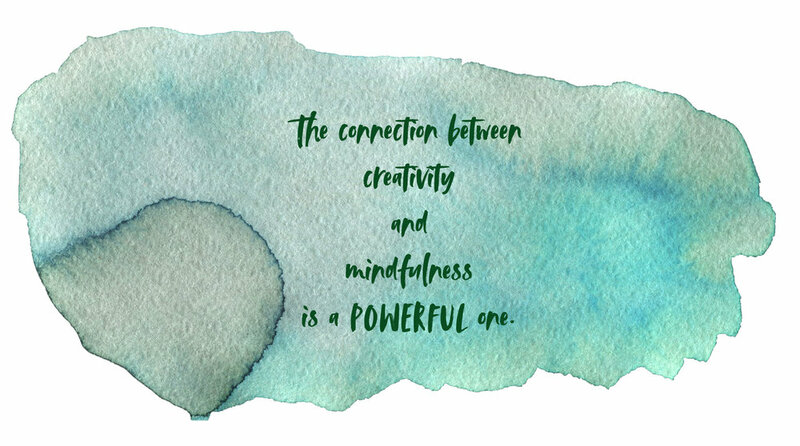 The connection between creativity and mindfulness is a powerful one. During creative practices the state of mind is not only relaxing, but allows us to meet our life exactly where we are. “It is in these periods of unfocused, wakeful rest that we have the opportunity to see things in a different way, make new associations and strike upon new ideas. 1 ” Mindfulness is all about training your mind to be present, so you can focus, succeed, be patient, be calm, and cultivate a joyful state of being. Through exploring creativity, we can develop our mindful awareness in order to make change or heal. “Although art expression cannot directly resolve conflict, it can provide a place where new attitudes and feelings can be expressed. 2”We focus inward on our intentions and desires through the creative process. These realizations help us to recognize habits of mind or catch “loops” that we might be in. With this cultivated awareness we can move into where we want to be instead of being stuck. Aesthetic experiences have the power to transform our perspective and thinking. Visual art is an essential element of personal identity. Art making is playful and visceral. Its nature brings us into the present moment. It can also bring us back to our basic (child) self. We return to wonder and reawaken our senses through marking marks and the use of various materials. I feel that we all benefit to going back to our child self once in a while, to soften our hearts, even if only for a moment. I believe that you can create new ways of thinking, perceiving, and being in the world. I promote wellness through joyful creative process, as well as through community collaborations to offer yoga, nourishing food and more. In my classes you will create freely and joyfully. Learning as you play.